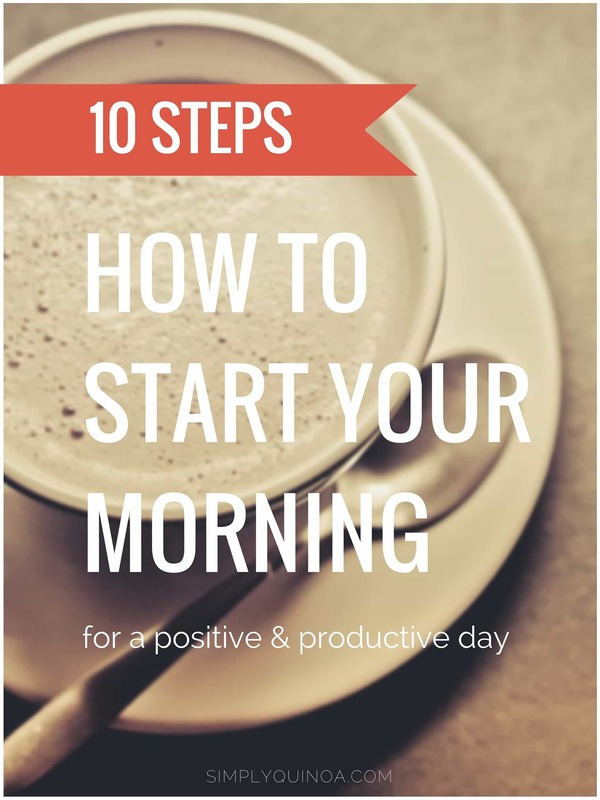 Learn how to start your day in a way that makes you feel more energized and productive. Follow these 10 steps to reinvent your morning routine. With a new season comes new opportunity. New goals, new experiences, new routines. It's a time to reflect on the old, but welcome in the new. Open your heart and mind to the possibilities of what this season can bring for you. Maybe it's finally achieving a goal or maybe it's picking up a new hobby or maybe it's even something as simple as creating a new routine. Whatever it is that's coming up for you right now, know that you can do it. Today I want to talk about something I've been working really hard on the last few months and that is creating a morning routine. This is a practice that I've been focusing on in my own life and have seen dramatic results. By starting my day more mindfully, I now have more energy, I am more focused throughout the day, my digestion is better, my skin is clearer, I don't have crazy mood swings and most importantly I feel spacious. My mind is more free and clear, and honestly I really feel amazing. Alarm goes off, we roll over and grab our phone. Check email, Facebook, Instagram, news and weather. Drag ourselves out of bed, pour a cup of coffee, hop in the shower, get dressed and we're out the door to work. If we're lucky, we have something like a piece of fruit or a breakfast cookie in our hand. Sound familiar? That's exactly how I used to start my day. And the trouble with that is that from the moment I opened my eyes in the morning I was flooding my brain with information. Then I topped it off a hit of caffeine on top of that and most of the time no breakfast. Basically, I was setting myself up to have a filled with stress, mood swings and blood sugar crashes. So what do we do instead? Below I'm sharing the 10 things I do every single day that has made a huge impact on my life. I've put them in the order that I do them in, but feel free to change it up based on your schedule. 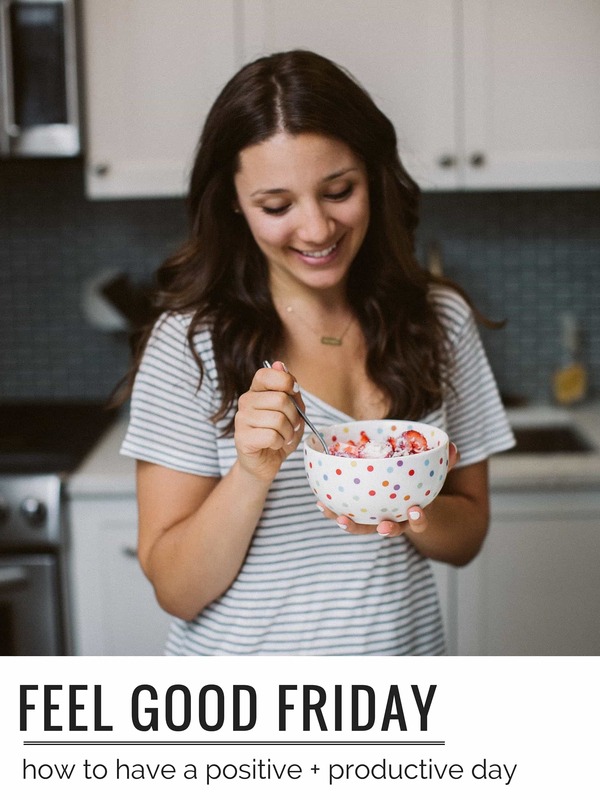 My hope is that these tips (even if you just incorporate some of them into your morning) will show you how to start your day and will also help you feel more positive and productive. Instead of looking at your phone as soon as you open your eyes, try to leave it until you're ready to walk out the door. I know that might sound a little extreme, but trust me, it works. Instead of spending your entire morning stressing out about how many meetings you have or that email that you need to respond to, you'll have the mental space to focus on you. I don't look at my phone until I sit down at my desk and am ready to get to work and you know what I've realized? The world doesn't end. Your work and social media can wait. You need to prioritize you. The next thing I do make sure I drink at least 12 ounces of water within 15 minutes of rising. Your body is dehydrated in the morning, so it's really important that before you get moving, you rehydrate. This is good for metabolism, for digestion and also energy. Feel free to also add a squirt of fresh lemon juice or some apple cider vinegar to rev it up even more. I'm a big believer is spending as much as possible in nature and while that might not be realistic for everyone, even if you can just step outside and take a few deep, cleansing breaths, I promise you'll feel the difference. It helps that I have a dog that needs to be walked each morning, but even though I live in NYC and don't have immediate access to the outside (I have to go downstairs in my building and then I'm on the street), just stepping outside makes me feel more invigorated and energized. I shared my workout routine in a previous FGF post, but I think one of the most important parts of my morning is that I move my body. And that can look different for each person, but try to at least squeeze in 15 – 20 minutes of movement. It could be something as gentle as stretching, or you could go for a walk, a jog or even do something more intense like an at-home HIIT/strength training workout or take a group exercise class. Getting the blood flowing will increase your endorphins, help you feel more energized, will rev up your metabolism and help you burn calories all day long. Not only is working out first thing in the morning great for fat burning and weight loss, but it really does help set the tone for your whole day. When I don't workout in the morning, I notice that I'm way less productive, I have a major crash in the afternoon AND I feel overall pretty darn sluggish all day long. Before I get in the shower each morning I dry brush my skin all over my body. I plan on doing a separate post and video about why dry brushing is amazing and how to do it, but it literally takes only 2 minutes and has helped my skin brighten my skin and helped reduce cellulite. Dry brushing also increases circulation, stimulates your lymphatic system and acts as a mini massage for your entire body. It's calming and so incredible. Another tip more for glowing skin than increased energy, but every morning I make sure to moisturize my face and body. This is an important part of my morning routine because now that my skin feels healthier and more radiant, I feel more confident and have a more positive view of my own body. Remember self-love = the best love, so anything you can do to make you feel better about yourself…DO IT! This is one that I'm still working on, but have read and heard so many benefits of meditation. Right now I only meditate for about 5 minutes and usually use a guided meditation by Gabby Bernstein. I have to be honest, I don't think I've found the perfect meditation sauce for me yet, but the little time that I do spend sitting in silence has made a difference in my productivity and mindset. If you're new to meditation, I think starting with a guided practice can be helpful. Or you can just sit on the floor or in a chair, set your timer for 5 minutes, turn on the Pandora yoga station and focus on your breathing. To stay focused, I usually breathe in on a count of six and breathe out on a count of six. This deep breathing is incredibly cleansing, but will also free up space in your mind and make your feel more at peace. This changes depending on the season, but eating a nourishing breakfast is SO important for your health. 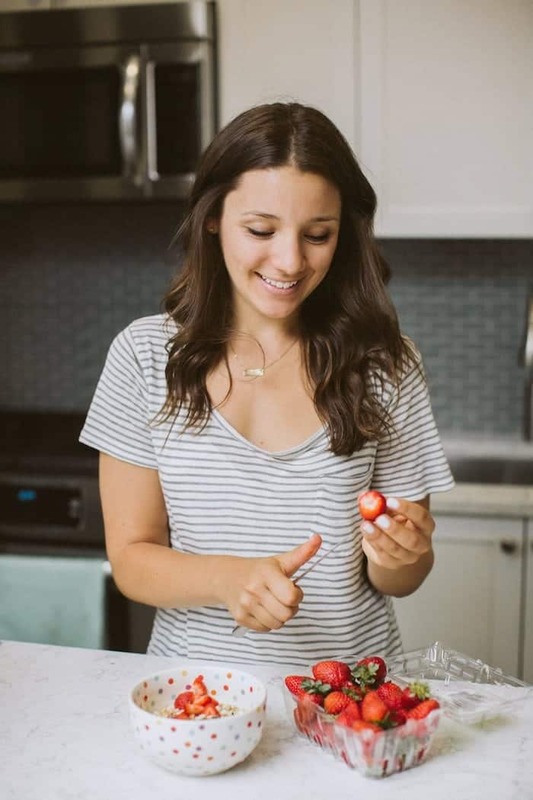 Not only are you getting your metabolism going, but you're also filling your body with nutrients which will help keep your energy up throughout the rest of the day. When I say “nourishing” I mean that you should try to build your breakfast around foods that will fuel your body – fruit, vegetables and whole grains are great choices. My personal choice is a smoothie bowl which I pack with tons of greens, some superfood powders, a plant-based protein powder and frozen fruit. It tastes like ice cream but it's super energizing and keeps me full for hours. 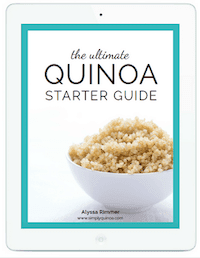 You can check out this video to see how I make it OR if you're looking for more breakfast ideas, check out my cookbook, Quinoa for Breakfast. This is a super new part of my day, but I'm totally loving it. You might have heard about Bullet Proof coffee, well this is my coffee-free version of that. Along with my breakfast, I now drink a “bullet proof” matcha latte. It's super easy to make and because of the MCT oil, it acts as instant fuel for my brain. I make my matcha lattes in my blender with about 1/4 of plant milk, 1 teaspoon of matcha powder, 1/2 teaspoon of medicinal mushrooms (totally optional), a sweetener of some sort (I'm liking monk fruit extract right now), 2 – 3 teaspoons of MCT oil and 1 – 1 1/2 cups of water. Just blend it all together it's the creamiest, most delicious, energizing drink. I am totally addicted. That being said, you can certainly do this with coffee instead of matcha, you could do it with chai or you could even do it with a turmeric latte or something like that. Finally, when I sit down at my desk with my breakfast and latte, before I even open my computer, I make my to-do list. I'm a big list maker and find that when I have things to cross off, I get way more accomplished during the day. Even if you're not into making lists, I think this strategy could really help you be more positive and productive. The strategy that I'm using now is to start with my “Top 3” list – these are the three things that I must accomplish by the end of the day. From there, I add any ancillary tasks that don't require as much immediate attention. By having that Top 3 list, I find that my whole day is much more organized and I'm way more productive. I know exactly where I need to be spending my time and when I get to the end of the day and see those three things checked off, I feel great. The planner I use is the Day Designer, but you could do this on a small piece of paper if you'd like. 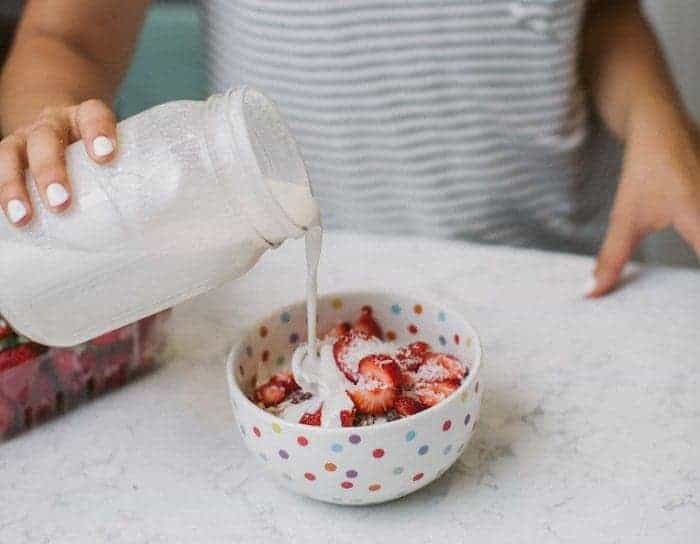 Stock your pantry with healthy, wholesome ingredients and if you're short on time, try whipping up a few portable breakfasts that you can take with you. Breakfast cookies, chia pudding and smoothies are all great options. Try it out for 2 weeks and then report back and let me know how it's going! I hope you found today's post helpful. If you have any questions, feel free to email me or leave them in the comments below. Now is YOUR time; give yourself permission to treat your body and mind with care and they will reward your back.